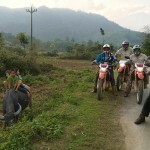 Another short motorbike tours in Vietnam designed by Vietnam Motorbike Tour Expert. 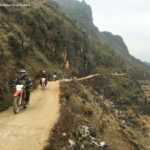 This motorbike tour is for people who don’t have much time can experience clearly the hidden charm of Vietnam with beautiful lakes on the mountains, green winding passes and colorful culture of the tribes in northeast Vietnam. Day 1. Hanoi – Vu linh. – 180 km. At 8.30 AM, we start the motorbike tour to Ba Be lake (Northeast of Vietnam ) from the outskirt of Hanoi. We will keep the bikes away from the busy traffic by taking a small, winding road along the Red river. Enjoy great view of the river and rice paddies as we ride through countryside and extensive farming lands comprising a sea of paddy fields. See the daily life of the local when being in the heart of the biggest delta in northern Vietnam – Red River delta. Lunch is at a local restaurant in Doan Hung Town. After lunch ride a great motorbike trip to Thac Ba Lake on the quiet road with a nice mountain view. The first day finishes at peaceful village of Vu Linh. Dinner and home stay in Vu Linh. Day 2. Vu linh – Ba Be National park. – 200 km. After breakfast, ride motorbike crossing over the the Song Gam mountain range and then take a great motorcycle tour through the rain forest on a rocky, bumpy and winding roads to Tuyen Quang, we continue on sealed road through renowned tea growing areas, where the hillsides are literally covered in plantations, From here it’s a short motorbike ride to the edge of BA BE Lake. Arrive Pac Ngoi Village where we stay overnight at 5 PM. Overnight in Pac Ngoi village – Home stay. After breakfast, take a short walk about 1km to the pier of the lake. Take a boat and enjoy a tour around Ba Be lake, take pictures of the breathtaking mountain views from the boat. Do some short trek in the jungle or short walk on some islands. Come back to the village at noon time for lunch, After that take a short motorbike tour to Bac Kan.
Dinner and overnight in Bac Kan – Hotel. Day 4. Motorbike Tour Back to Hanoi. – 220 km. Leaving Bac Kan, we head south to go back to Hanoi, we will take the small paved roads to avoid the busy traffic. Lunch is in Thai Nguyen . Arrive in Hanoi before rush hours and finish perfectly the North Vietnam motorcycle tour to Ba Be Lake.